The Nasty Housewives, an interesting name for an interesting and unique band. 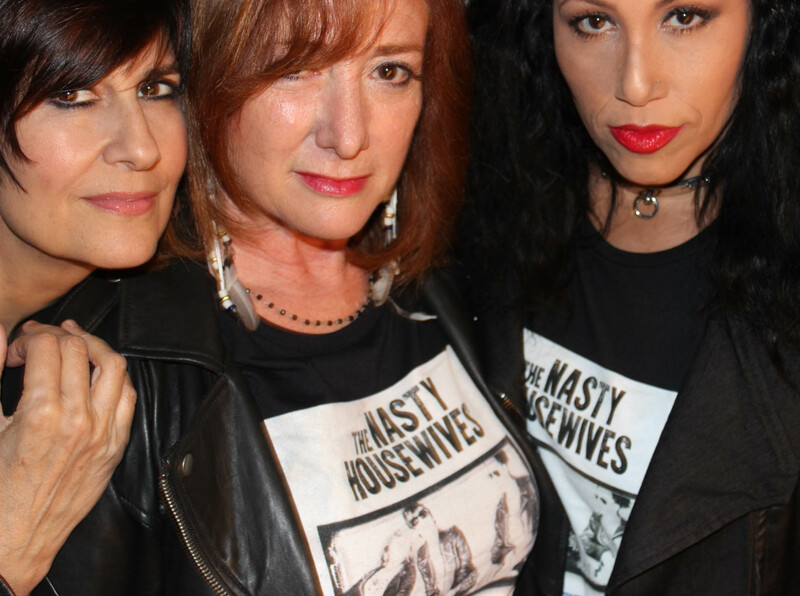 The Nasty Housewives consist of Marcella Detroit (also known as Marcy Levy (Shakespears Sister), Hope Juber (The Housewives) and Roberta Freeman (who has worked with Pink Floyd, Elton John and Lou Reed to name just three). Helping them on RESisters, their debut album is Laurence Juber (husband of Hope and once a member of Wings). Marcy Levy’s husband, Lance Aston, also helps out with photography, and some co-writing. It is kind of a supergroup, L.A. style from where the band is based. It also feels very much like a family affair. Over the last year or so videos and songs started popping up on Marcella Detroit’s Facebook page as well as other pages. The videos were brilliant and the song are discussion points. It was clear that they were not happy with Trump. It made for interesting listening and viewing. The question was would there be an album. RESisters is that album, and it is welcome in today’s musical and political climate. This is one of the most important albums of the year. It is a full-fledged protest album. 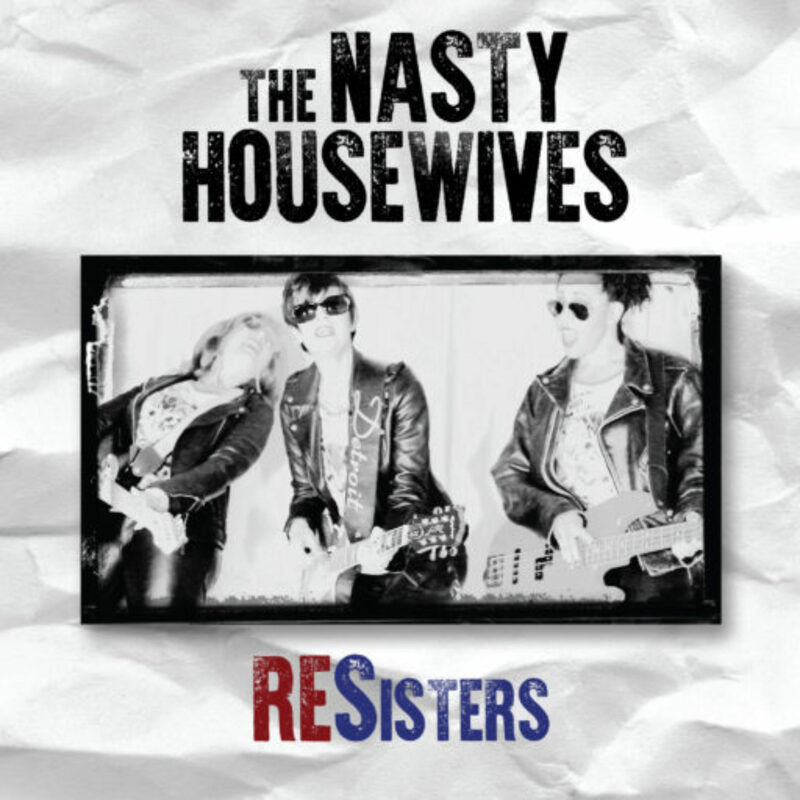 The three artists who have teamed up to form Nasty Housewives are not supporters of Donald Trump, and this is made clear throughout the entire album.. “Alternative Facts” and “Not My President” are just two examples. Perhaps the best example is the beautiful and incredible “The Bowling Green Massacre”. But this is not rant for rant sake, this is well thought out reasoning why they do not support Trump. But RESisters is more than just an anti-Trump album. Much more. Feminism, the decline of society and acceptance. What you get is an album from three angry women (and their spouses). And on top of great lyrics, you also get some top notch playing from Detroit (her guitar and harmonica are inspiring) and Laurence Juber who handles pretty much everything else, except for the drums, which Denise Fraser handles with great talent. As heavy as all of this sounds, there is a great deal of humour throughout. Just watch any of their videos. These artists know how to deal with this material in a mature, funny and extremely creative manner. “The Legend of Narcissus” must be heard, and should be on radio in high rotation. The vocals and harmonies are flawless. These three complement each other and their voices form a solid sound. It is a wonderful experience and makes for a one of a kind listening experience. Not folk, not rock, not M.O.R. it is their own sound. Everyone in this project has their own well established, substantial solo careers. This coming together of talented artists was due to their common concerns with Trump. While Algiers released a similar thematic album, The Underside of Power, this album takes on a more personal slant. Both albums are protests against Trump’s America, RESisters has more of a human element. The Nasty Housewives (great name) have released a peaceful protest album. It also has some fine music to match the lyrics. A great album.